Insoles for Flat Feet- Are They Effective? One of the most common questions I am asked by people who suffer with flat feet is, "Can a pair of arch support insoles really relieve my discomfort?". It turns out the answer is a little more complicated than a simple "yes" or "no". First, it's important to note the arch support insoles can not actually "cure" flat feet. However, flat feet can cause a variety of painful symptoms in the feet. Many of these symptoms have been treated, and often relieved, by arch support insoles for decades! One of the keys to correctly choosing an over-the-counter arch support insole is first understanding what "flat feet" are, and why discomfort often accompanies this condition. Flat feet, also known as fallen arches, are a common condition seen in both adults and children. Normally, feet have an upward longitudinal curve in the middle called an arch. This arch is formed by a group of tendons and ligaments attached to the heel and foot bones. Tendons in the lower leg , along with ligaments in the foot, work together to pull and form the foot's arch. However, if the tendons do not pull sufficiently enough, there is a low arch or no arch at all. This condition of collapsed arches is popularly known as flat feet. Flat foot can affect one or both feet. The lack of crucial arch support in the foot can cause many complications. In people with fallen arches, the normal pressure of walking shifts to other parts of the feet. If not treated properly, this can cause prolonged discomfort, pain, and in some cases, serious joint and foot problems. The risk of developing flat feet also increases with diabetes, pregnancy, obesity and aging. The most common symptoms of flat feet are pain and discomfort, particularly in the arch and heel area (this may be diagnosed by your doctor as plantar fasciitis). Prolonged walking and standing can be uncomfortable in people with collapsed arches. Often, there is a swelling in the inner bottom of the foot. Due to lack of a supportive arch, there can be substantial pressure on other parts of the foot, leading to strained posture and restrained foot movement. A fallen arch can also strain the ligaments and tendons of the foot and leg. Flat feet have been suspected in contributing to back, hip or leg pain, ankle sprains and arthritis. Wearing the right shoes, and possibly over-the-counter insoles, can be tremendously beneficial in alleviating and preventing pain and discomfort. In addition, taking proper care of the feet and following a consistent home exercise regimen, prescribed by your doctor or physical therapist, can be very effective in prevention and management of the symptoms. A physical therapist or doctor can also suggest suitable stretches to prepare the feet before an intensive activity. It is similarly important to effectively treat or limit conditions that can aggravate fallen arches, such as diabetes or obesity. Avoiding high-impact sports and strenuous activities might be beneficial in some cases. If over-the-counter insoles are not effective in improving the symptoms of flat feet, custom orthotic devices or braces can possibly provide adequate support to the arch area. In some cases, where the damage or pain is severe, a doctor may recommend a suitable surgical procedure to improve foot support and bone stability in the area. “How Do I Pick the Right Insoles for Flat Feet?" It is important to choose an insole that is neither too rigid, nor too flexible. An insole that is too firm provides little shock absorption during activity. When force is applied to this type of device, the material or design of the insole does not compress adequately, and the shock generated from your foot striking the ground is transmitted back into the joints of your body. This can often lead to back, knee and ankle discomfort. 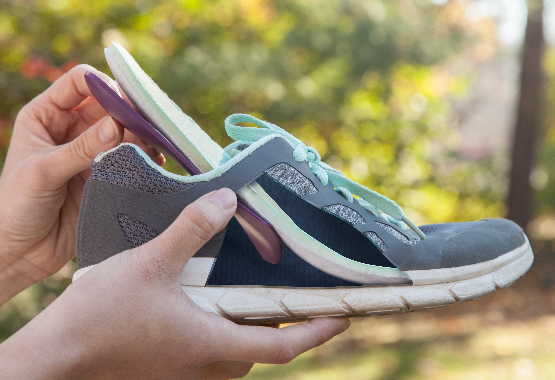 On the opposite end of the spectrum, an insole that is too "cushiony" may feel comfortable initially, but due to the lack of support, these devices often fail to alleviate the symptoms caused by flat feet. These types of insoles are often manufactured from a compressed foam material. It is usually apparent within the first few uses that the support provided is inadequate. It is popular for insoles to be sold in "approximate sizing". Often, this leads to an inadequate fit for many users. Certain individuals may be "in between" sizes for the vast majority of insoles on the market, leading them to believe that an over the counter insole may not be effective for them. For this reason, it is important to confirm that any insole you purchase fits your foot and arch appropriately, regardless of the manufactures' suggested sizing. Regardless of the insoles you ultimately choose, it is important to break in these types of devices over a prolonged period of time. Your foot may not be accustomed to the level of support a new insole provides, and it may take some time for the muscles and ligaments to acclimate. Check out the Samurai Insoles homepage for more information about insoles for flat feet, and to explore the specific qualities of insoles that can provide quick relief.